Since the Penguins won against the Red Wings yesterday I thought it was the perfect time to travel down memory lane to a game against the same opponent when my siblings were visiting a couple of years ago. I was one heck of an ice-skater when I was a kid (and I still am). Once the ice on the pond, home on the farm in Sweden, was thick enough we would clear the snow and skate and skate and skate. At school we played hockey in between classes for most of winter. I was the only girl in my grade (we were less than 20 kids in 4-6th grade combined) and when I played hockey it was not uncommon that one of the boys had to leave the ice with a bleeding nose. Ha! We always watched the world cup in hockey on TV, and as Peter Forsberg and Mats Sundin had their big moment in the NHL, the score from the previous night’s game was often reported in the morning news. I never paid attention to the Pittsburgh Penguins back then though. That all changed when I moved to Pittsburgh. 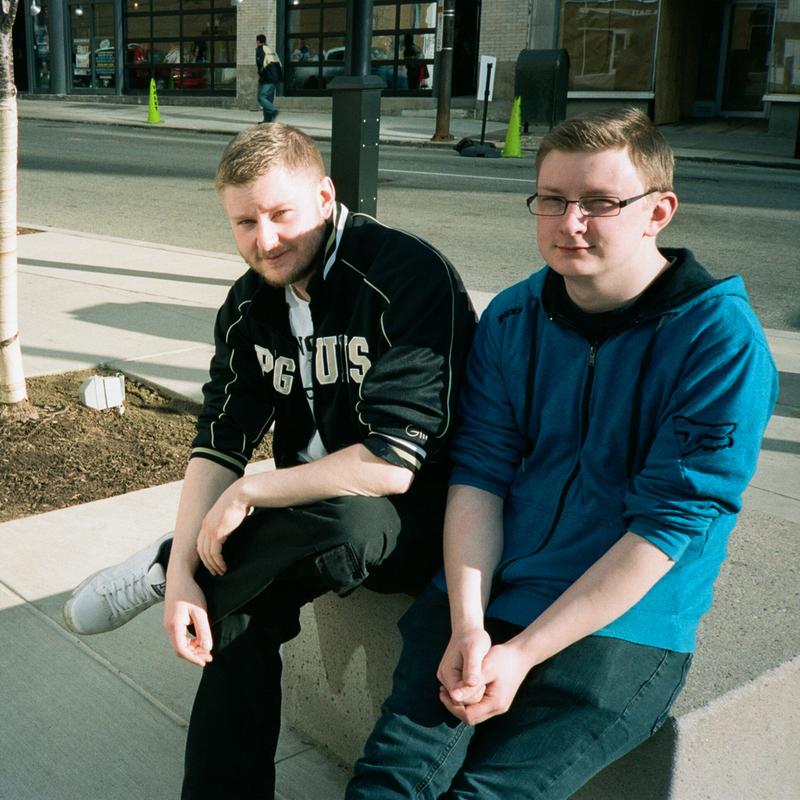 My brothers Erik and Viktor adopted the team as their favorite, and once they and my sister Emeli visited me here, we attended our first NHL game and I think all of us had to pinch ourselves that we were literally in the arena. What an atmosphere! Since that first time at Consol Energy Center I’ve come to equal hockey with sibling time, and many associated memories. 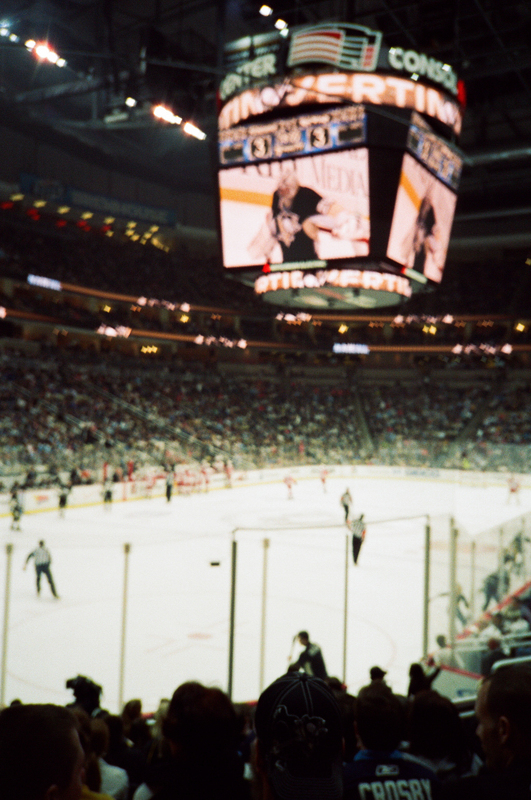 I think I’ve received the best brother hug ever when Erik and I went to a game and the Penguins scored an epic goal. 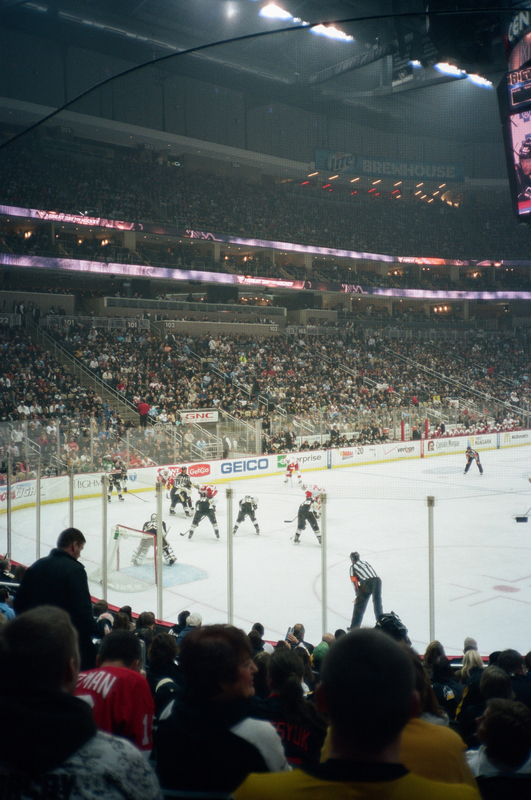 Another time when Erik visited Pittsburgh, he and my husband went to a game and sat fairly close to the ice. Viktor was watching the game on Root Sports in Sweden, spotted the two of them, took a picture of the TV, posted the picture to Facebook, and tagged the two of them. It was hilarious! Even when I'm in Sweden, the Penguins keep popping up. One night I was checking my email, and my brothers were watching the Penguins documentary where they were preparing for the Winter Classic against the Capitals. I glanced over to the TV just as one of the players drove through the Fort Pitt tunnel. Talk about surreal feeling, to watch something so familiar from so far away. Alright… enough nostalgia… and back to the Red Wings game. My brothers had long dreamt about sitting by the glass. My sister, husband and I were more than happy to sit a bit further up though, so we parted ways and found our assigned seats. As the players made their way out onto the ice my brothers yelled at the Swedish Red Wings players (this was before the Pens had any Swedes on their team) to go home… in Swedish (oh boy!). Suddenly one of the players turned around and smiled at them. The evening was made for my brothers. It was a great game, and as the beer consumption increased, my manual focusing ability with my rangefinder film camera decreased. Even though the last shot is a complete blur, the memory is still strong. Let's Go Pens!